Over the past two weeks the department has welcomed two visiting Master’s students from University of Dar es Salaam in Tanzania. Clarah Kimani and Karim Mtili have been learning about mass spectrometry in the Noble Lab, headed by Professor Chris Ballentine. The opportunity arose from an academic partnership with Helium One, a helium exploration start-up company operating in Tanzania. Rifting and associated volcanism in the country make it the perfect target for prime helium exploration. Research Fellow Dr Pete Barry had already led several expeditions in Tanzania with Helium One to collect surface gas seeps from the rift, discovering gases that contained up to 10% by volume helium. 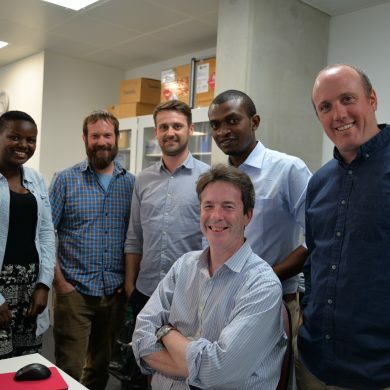 The company funds two scholarships at the University of Dar es Salaam, which includes the opportunity to work with the team at Oxford University over the summer, to learn more about the sampling and analysis of noble gases, and training on the miniRUEDI, a portable mass spectrometer. This is the same type of equipment that they will be deploying in the field in Tanzania. 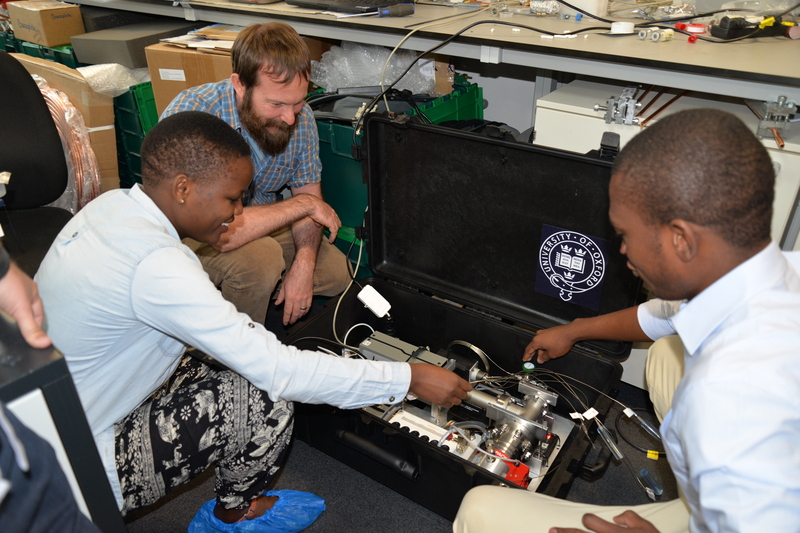 Dr Darren Hillegonds oversees visiting Masters students Clarah (L) and Karim (R) as they experiment with the portable mass spectrometer. It’s not all been work. The students have had the opportunity to visit the Natural History and Pitt Rivers museums, the Botanical Gardens, the Bodleian Library, Christ Church College, and even some of the more famous pubs such as the Turf Tavern for that true Oxford experience. When the students return to Dar es Salaam, they will be going into the field with Helium One and Pete Barry, to apply their new-found skills with a miniRUEDI. They will also be presenting their updated knowledge to their peers and faculty at the Department of Geology at the University of Dar es Salaam. Find out more about the research undertaken in the Noble Lab, and read an article about the group’s wider work in this area in our 2017 Earth Sciences News (pages 4 & 5). Find out more about Helium One. Main image: L-R: Clarah, Darren, Josh Bluett (Technical Director, Helium One), Karim, Pete, with Chris seated, front.